How to watch Always (1989) on Netflix Portugal! Sorry, Always is not available on Portuguese Netflix, but you can unlock it right now in Portugal and start watching! With a few simple steps you can change your Netflix region to a country like USA and start watching American Netflix, which includes Always. We'll keep checking Netflix Portugal for Always, and this page will be updated with any changes. Always is not available in Portugal BUT it can be unlocked and viewed! A firefighting pilot who dies and becomes a guardian angel to new pilot Ted Baker has trouble dealing with Ted's feelings for the girl he left behind. 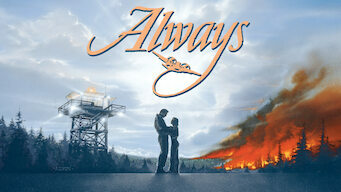 After a firefighter pilot dies, his spirit guides the young flyer who falls for his girl. Even an angel can be jealous. There is a way to watch Always in Portugal, even though it isn't currently available on Netflix locally. What you need is a system that lets you change your Netflix country. With a few simple steps you can be watching Always and thousands of other titles!